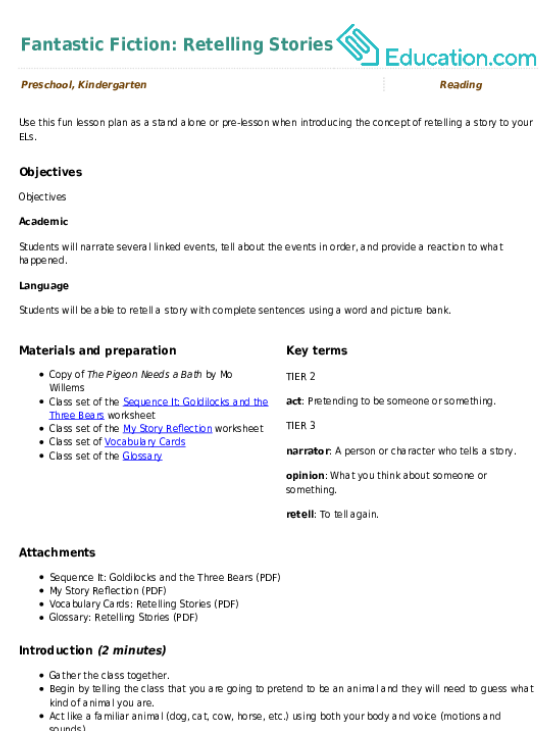 This lesson can be used as a pre-lesson for the Comparing Whales lesson plan. act: Pretending to be someone or something. narrator: A person or character who tells a story. opinion: What you think about someone or something. Students will narrate several linked events, tell about the events in order, and provide a reaction to what happened. Students will be able to retell a story with complete sentences using a word and picture bank. Begin by telling the class that you are going to pretend to be an animal and they will need to guess what kind of animal you are. Act like a familiar animal (dog, cat, cow, horse, etc.) using both your body and voice (motions and sounds). Ask the students to guess the animal. Have the students turn and talk to a partner to share how they knew you were that animal (e.g., body motions, sounds). Tell the class that since you aren't really an animal, you were acting like one. Acting is when you pretend to be something you are not. Explain that today they will get to retell a story by acting it out. Introduce new vocabulary words using student friendly definitions and visuals. Explain that you will practice retelling a story in order using words before acting it out. In the end __ . Have students turn and talk to a partner using each sentence frame to tell about their day at school so far. Model a conversation with a student volunteer. Remind students to maintain eye contact and ask their partner questions. Read aloud Pigeon Needs a Bath by Mo Willems. Ask the students to think about what happened in the beginning of the story, middle of the story, and end of the story. Write and draw on the board to capture student thinking to provide a written and visual word bank for the students to use. Ask students to think about what they liked or didn't like about the story. Explain that this is called an opinion. Put students in groups of two and have them practice acting out the story, one person acting as the pigeon and the other as the narrator. Remind students to take turns and work together to retell the story. 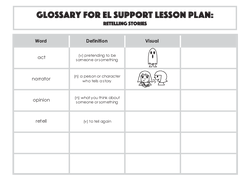 After five to seven minutes, pause students and pass out the My Story Reflection worksheet and have students use words and pictures to share their opinion of the story. 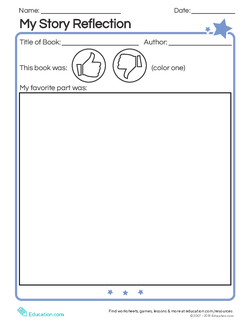 Provide copies of the book for students to use during the paired work time. 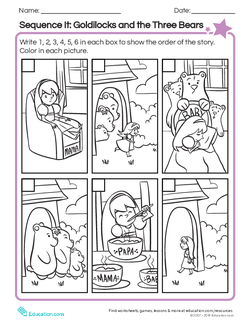 Have students practice retelling a story in order using the Sequence It: Goldilocks and the Three Bears worksheet. 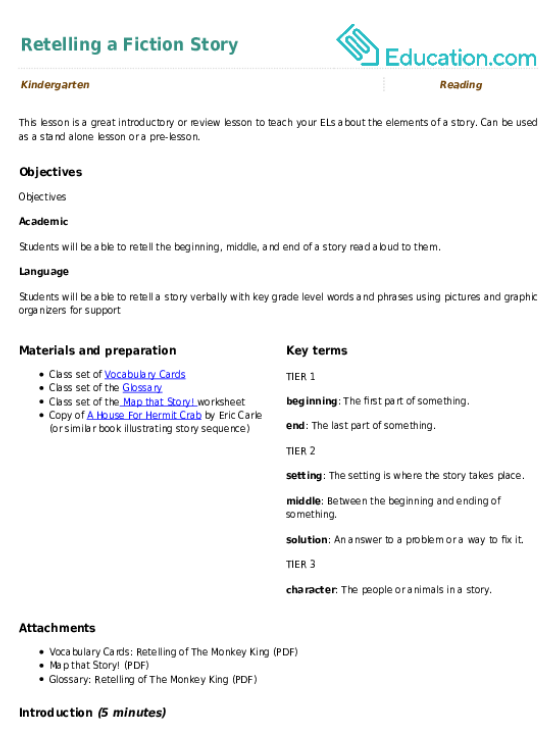 Display a visual word bank for students to utilize. 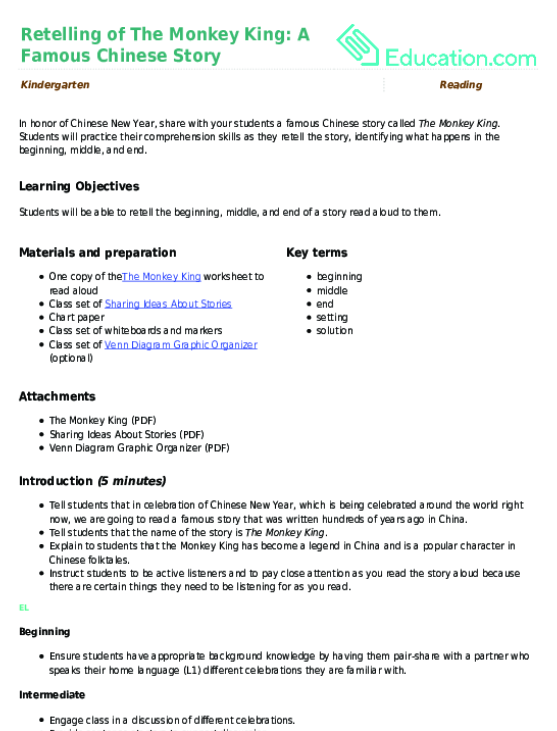 Listen to students as they act out the story to assess if they are able to tell it in order. Check that they are working together and including details in their conversations. Collect student work samples to assess if they are able to share an opinion about the story using words or pictures. Invite one or two pairs to perform the beginning, middle, end of the story for the class. Discuss how different people might act out the same story in different ways. Review any confusing concepts as needed. Kids love telling stories. Encourage your kindergarteners to practice retelling familiar stories as they recount their very first day of school. Encourage your kindergarteners to practice retelling familiar stories, with pictures, as they recount a past holiday. 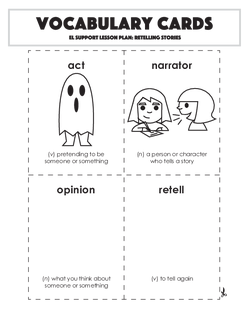 Use this worksheet as a way for students to practice retelling a familiar story using their own words and images. Kids love telling stories, especially about their families! Encourage your kindergarteners to practice retelling familiar stories as they recount a favorite time with their family. 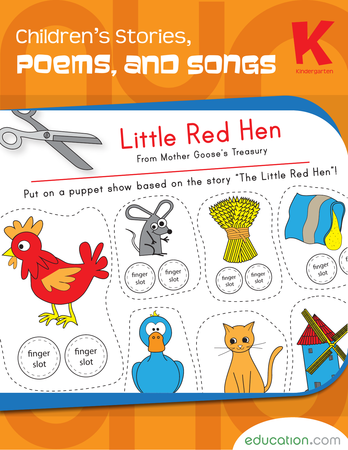 Read the stories, poems, and songs. Then, answer the thoughtful questions that follow.